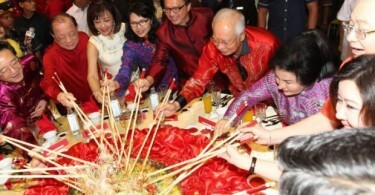 BAGAN DATUK, Jan 28 2017 : As the Chinese community celebrates the arrival of the lunar new year by visiting relatives and friends, Deputy Prime Minister Datuk Seri Dr Ahmad Zahid Hamidi paid a visit to his old friend Beh Song Wan to celebrate the Chinese New Year today. Ahmad Zahid, who is also Bagan Datuk Member of Parliament, arrived at Beh’s house in Taman Desa Bersatu, Simpang Empat here at 5.30 pm, and spent about 30 minutes catching up with his good friend of 26 years. 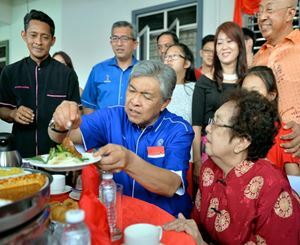 Among the dishes prepared by the 54-year-old Beh were Ahmad Zahid’s favourite boiled cassava, lontong and golden pomfret curry. “For more than 10 years now, he would come visit me here every time we celebrate the Chinese New Year and it made us happy, especially my mother, Cheah Seoh Lian, 76, who is quite close to him.